You have a router or switch and you want to graph the traffic forwarded through its interfaces. You have used Web based tools to do that and to keep the historical data, but you’d like to get a real-time graph for your traffic. Or, you don't really have the time or desire to set up a web server and install relevant web tools. Sounds familiar? iNetGrapher is the right application for you! iNetGrapher is a small application that’s designed to allow Network Administrators instantly see in real-time how much traffic is passing through any SNMP-enabled device. Just enter the hostname and community, pick the interface from the list and voila! 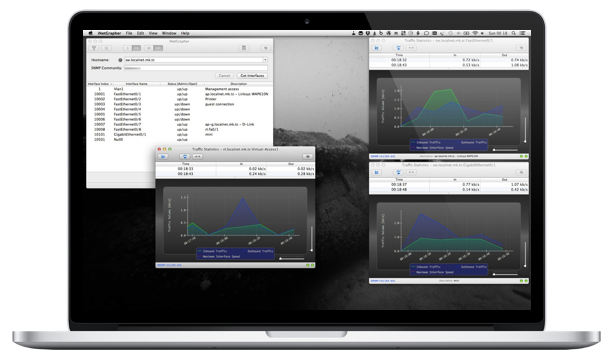 iNetGrapher allows its user to run multiple graphs for multiple interfaces and devices simultaneously. Now you can immediately check what effect the changes you make in the network have on the traffic. Written with Network Administrators and Network Engineers in mind as primary users, the tool will also be useful System Administrators wanting to measure traffic in and out of their servers or any user curious to see which device generates or receives traffic in their network.